The lights on the buildings along the rue Sous le Fort in Old Quebec in Quebec City, Canada are illuminated at blue hour. 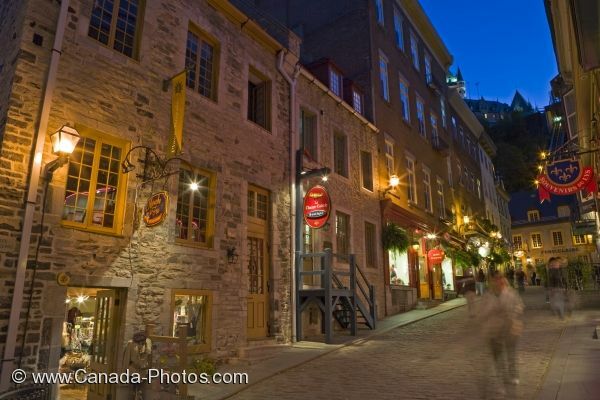 People wander along rue Sous le Fort in Old Quebec in Quebec City, Canada at blue hour and explore the shops as the lights emit a golden glow to the street. A romantic atmosphere surrounds the cafes and restaurants at blue hour and gives people time to relax and enjoy a good meal. Blue hour along rue Sous le Fort in Old Quebec, Quebec City, Quebec, Canada. UNESCO World Heritage Site. Picture of rue Sous le Fort at blue hour in the town of Old Quebec in Quebec City, Canada just as the street lights come alive.